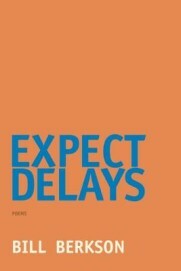 As a follow-up to his Portrait and Dream: New and Selected Poems (Coffee House Press, 2009), Expect Delays brings together pieces written within the last ten years, including the chapbook “Not an Exit.” More so than other poets, one noticeable trait in Berkson’s work is that so much of it is engaged in conversation with the work of others, be they classical artists or friends from New York and San Francisco. Thus, many names (familiar and unfamiliar) wander across these pages, such as Frank O’Hara, Kenneth Koch, and Philip Whalen. While this could be dismissed as “name-dropping” in other hands, in Berkson’s it is a gentle reminder of how much is owed to one’s peers. Furthermore, the warmness with which he writes only affirms that the most prolific literary communities are those that in fact are a community. “Songs for Bands” suffers from the problems all published diaries have, which is that some parts feel rough or underdeveloped; some lines read like first drafts, others like notes meant more for the writer than an audience. But even with these minor problems, the author elevates the writer’s notebook to its own art form, showcasing it as a distinct genre of literature. It is poetry and prose, essay and diary, a text whose value is its many forms joined together. That, coincidentally, is also the perfect description of Expect Delays and Berkson’s work more generally. Both refuse classification—and both are better because of it. This entry was posted in Uncategorized and tagged FALL 2015 on December 2, 2015 by Kelly.